Please reach out to Dr. Subhendu Kumar Rath, Deputy Registrar, Biju Patnaik University of Technology at deputyregistrar@bput.ac.in for any doubts/queries about the accommodation or on how to reach at the venue. We hope all the team leaders of the shortlisted teams are receiving regular emails from us. If any team leader is not receiving the emails of further process and updates, please reach out to akash@hackerearth.com ASAP. Kindly find the shortlist for the online round here: http://hck.re/odishahacklist. Consider this as the final shortlist. The shortlist status on candidate's profile on the platform will be reflected on 22nd Oct Monday. The shortlist has been done on evaluating the submissions primarily on these metrics: Idea, Complexity, and Creativity. Congratulations to the shortlisted teams! You are cordially invited for the offline round of hackathon in Bhubaneswar on 13th and 14th of November. You can now start making your travel arrangements. The accommodation to the shortlisted teams will be provided from 12th of November till the day of the hackathon. The arrangements will be made inside 10 kms radius of the college premises. Train Travels (up to 3 Tier AC) will be reimbursed under three working days only after providing the ticket receipt in original. You can contact the help desk during the time of offline hackathon to submit proof of travels. If you are planning to travel by bus, make sure the fare is less than that of the fare of AC 3 Tier Train travel for the same route. The shortlisted teams can contact at akash@hackerearth.com for any other queries/doubts. The Make in Odisha Conclave-2018 is the flagship biennial business event of the Government of Odisha. The conclave focuses on identifying growing practices which can contribute towards the development of the state. It opens, invites and nurtures purpose-driven entrepreneurs harnessing the power of technology to solve some of Odisha’s toughest problems using business models that are specific to the state or can be replicated in similar scenarios, anywhere in the country. Being a global platform, it provides a runway to innovative ideas from where they can take off and soar high. The student community is an integral part in venturing development projects owing to their innovative and enthusiastic approach towards a problem. To harness their talents, “Smart Odisha Hackathon” involving students across India is being organised on 13th -14th November 2018 at College of Engineering and Technology(CET), Techno Campus, Kalinga Nagar, Ghatikia,Bhubaneswar by Skill Development and Technical Education Department, Government of Odisha in association with the Biju Patnaik University of Technology (BPUT), Odisha. The idea behind the 36 hours Hackathon is to attract talented brains to identify innovative IT solutions for public service delivery and good effective governance. Any student is eligible to take part in this hackathon irrespective of Stream, Graduation year and College. Each team will have 4 members and 1 Mentor (optional). Mentor may be Teacher, Senior Alumni or person from industry also. The students will have freedom to choose their team and Mentor irrespective of colleges. The hackathon time will be of 36 hours of duration (continuous). Problem: Delay in settlement of crop insurance claims under Pradhan Mantri Fasal Bima Yojana and their rejection by insurance companies. Statement: The Government of Odisha has enrolled over 20 lakh farmers across the state under Pradhan Mantri Fasal Bima Yojana (PMFBY) this year. The number has been increasing every year, and it is hoped to cover 40 lakhs farmers annually soon. Even though the scheme has been designed to be pro-farmer, there have been operational issues in the field. One such challenging problem is the delayed settlement of insurance claims and their rejection by insurance companies. Due to these issues the state has witnessed farmer’s agitation for better clarity in the settlement and disbursement of insurance claims. A suitable App or other solutions need to be developed to track the insurance claim settlement and payment by the insurance companies and its receipt in the farmer’s bank accounts under PMFBY. Track the crop insurance claim settlement. Track disbursement by the insurance companies. Track the claim settlement in the farmer’s bank accounts under PMFBY. Problem: Every year the plantation is being done in many parts of Odisha. Many saplings planted with so much enthusiasm and fanfare on different events die an untimely death due to lack of care and maintenance. Statement: Citizens are showing more significant interest in the planting of trees due to the increase in awareness on environment among the people. Further, more and more individuals and institutions are coming forward for tree planting. In many functions, planting of a tree has become an indispensable part. It is quite encouraging to see that, especially during rainy season, Government or non-Government organizations, individuals and institutions go for the planting of trees with much enthusiasm and fanfare. Government organizations also distribute sapling free or at nominal cost to individuals and institutions to encourage tree planting. In the process, millions of trees are planted every year. However, many saplings planted with so much enthusiasm and fanfare die an untimely death due to lack of care and support. It needs a little attention and protection against grazing, dry condition, and hazards of other biotic and abiotic factors. Saplings raised by the nurseryman with lot of care and skill in picking the best quality seed, its proper treatment for better germination, adequate mixture of soil and manure, watering and weeding for six months or even prolonged period for two to three years in case of tall saplings, conditioning of plants to withstand adversity of nature etc. All these labour and time is wasted when the seedlings die due to lack of care. Planting a tree is just the beginning. It had to be taken care of and nurtured as a kid. In this age of GIS, to watch the trees we plant, we have to locate it in Google map and create a database with Geospatial reference. Thereby we can identify our plant and know about its present condition. This data has to be accessible through a simple Smartphone application by all citizens. A suitable App or other solutions need to be developed to Geo-Tag the trees and have a database of such plantations with Geospatial reference. Track the trees we plant. Locate it on the Google map. Create a database of such plants/trees with geo-spatial reference. Locate the plant/tree and know the present condition. Stakeholders: Forest Department, Other Government Departments ,International institutions, non-Governmental organizations. Problem: Lack of poor alumni tracking and alumni interaction among students graduated and passed out from Odisha educational institutions. Statement: Odisha Universities, schools, and other institutions are poor in alumni tracking and alumni interaction. Every year students are graduating from different Universities of Odisha, schools and other institutions. However, there is no one-stop platform for the alumni to register, share, network and communicate among themselves and with their alma mater. It will be useful if the alumnus is tracked and brought on a single platform. On the platform, the information to be captured of pass out students of 10th, 12th, Graduation, Post Graduation, and scholars. The one-stop platform (bi-lingual) for the alumni has to register and facilitate interaction of students among themselves and with their alma mater. Problem: Non-Communicable Diseases (NCD) are estimated to cause more than 60 % of all deaths. Statement: Non-Communicable Diseases(NCD)are estimated to cause more than 60 % of all deaths and considerable loss in potentially productive years of life as they are chronic in nature. Solution expected: One solution could be An App that can be developed for information on Healthcare service delivery centers and facilities available to the public on location nearby to them along with timing. The capture of data may increase the base of beneficiaries in the different Government health centers consistently and may improve quality of health care service delivery by tagging of patients to health facilities. Stakeholders: Public, Government, Health care providers. Problem: The government faces challenges in the mobilisation of youth from all parts of Odisha for skilled training, handholding them during training and online tracking of Alumni who are skilled and placed. Statement: India has one of the largest technical workforces in the world, and Odisha plays a very significant role in that. However, there is still tremendous scope for improvement in this area. Generally, the emphasis has been on formal education, with vocational training at the receiving end. In the year 2017, Odisha started a massive campaign on World Youth Skills Day by launching an awareness campaign across all districts through Skill Caravan. The primary objective of this campaign was to create awareness and sharing of information with the prospective target groups which shall make skills aspirational for the youth of Odisha. The skill caravan visited all Panchayats, High Schools, and Skill Development Centers along with senior officials and Role Models for the dissemination of information about the skill development through role model and multimedia interaction. There are two types of skill training being conducted, i.e., Long Term Skilling where Polytechnic/ITIs are at the forefront and short-term skilling under PMKVY, DDUGKY, and other Placement Link Training Program. Department is looking for a technological solution to address the critical issues of mobilisation of students and tracking post placement for impact assessment of the course. Mobilisation of right candidates after counseling and informed choice is big challenge for youth to join skill ecosystem. After skilling and placement, tracking of youth is major challenge. This shall help in reducing the attrition rate and also analyse the impact assessment of training. Problem: Lack of efficient Land Management, Encroachment Control and enforcement of town planning regulations in urban areas. Encroachment of Govt. Land such as Roads, vacant plot, Foot path etc. Encroachment on Drains, Natural Water Course hampering free flow of water. Unauthorized construction ,violation of Building Plan approvals and construction beyond the permissible limits. Solutions expected: Finding a Digital Solution which would assist the Housing and Urban Development Department to effectively manage Land, Encroachment and enforcement of town planning regulations in urban areas. Odisha is facing some unique problems which may have not been recognized by the government departments. We are inviting the students to come up with ideas which are path breaking and provide apt solutions. This is open to all for new innovation which can be utilized in Public Utility Service or Government platform problems. This is only restricted to problems of Odisha. a. More than twenty PRIZES to be won amounting to more than INR 21,00,000.
b. The best three teams from amongst seven sectors will qualify for 1st Prize, 2nd Prize and 3rd Prize amounting to Rs. 1,00,000/- , Rs. 75,000/- and Rs. 50,000/- respectively. 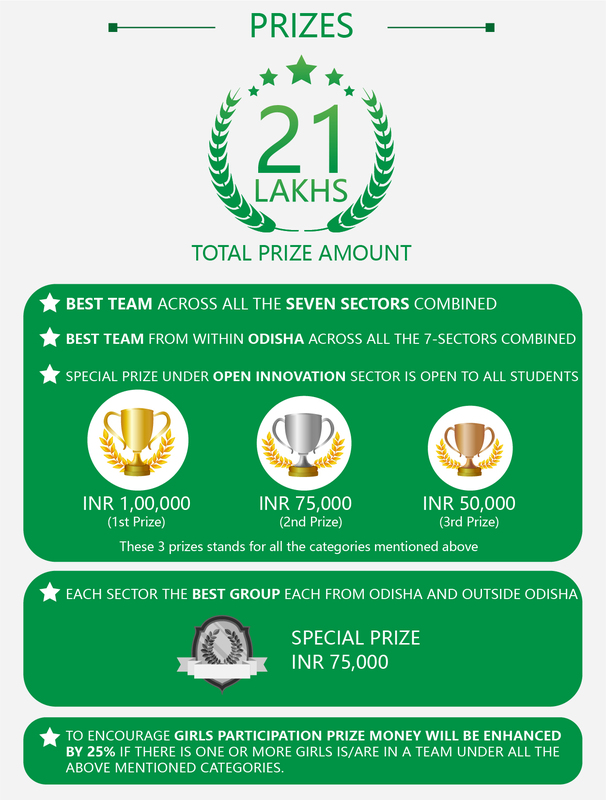 c. The best three teams of Odisha amongst seven sectors will qualify for 1st Prize, 2nd Prize and 3rd Prize amounting to Rs. 1,00,000/-, Rs. 75,000/- and Rs. 50,000/- respectively. d. More over from each of the seven sectors, the best group from Odisha and Outside Odisha would receive a Special Prize amounting to Rs. 75,000/- separately. e. A Special Prize under Open Innovation Sector is open to all students which carries 1st Prize, 2nd Prize and 3rd Prize amounting to Rs. 1,00,000/-, Rs. 75,000/- and Rs. 50,000/- respectively for giving innovative ideas and solutions related to specific problems of Odisha. f. To encourage the Girls’ participation, the prize money will be enhanced by 25%, if there is one or more girls is/are in a team. All the participants will get a Participation Certificate.